The Oklahoma-produced film “Painted Woman”, previously titled “The Mustanger and The Lady”, will continue its theatrical release with newly added screenings in both the Tulsa and Oklahoma City area over the next two weeks. Based on the acclaimed novel, The Mustanger and The Lady from prolific western writer Dusty Richards, “Painted Woman” is a western romance about Julie Richards, a young woman who finds the courage to escape her captive lifestyle after being forcefully held against her will as a prostitute. As she travels through the dangerous landscape of the American West, Julie encounters a carefree Mustanger who may be the key to her survival if she can outwit the vengeful mercenary trailing her. Directed by Oklahoma native James Cotten, the film stars Stef Dawson (“The Hunger Games: Mockingjay”), Matt Dallas (“Kyle XY”), Kiowa Gordon (“The Twilight Saga: Breaking Dawn”), and David Thomas Jenkins (“Return to the Hiding Place”). “Painted Woman” will celebrate its Tulsa release at the AMC Tulsa Hills on Friday, December 1. A red carpet event will be held at 7:00 p.m. on Saturday, December 2, featuring the film’s Director James Cotten and Producer Amber Lindley as well as Dusty Richards, the author of the book on which the film is based. The following week, “Painted Woman” will begin screening in Oklahoma City on Friday, December 8, at the AMC Quail Springs Mall and will also feature a red carpet event with Cotten, Lindley and Richards present. “Painted Woman” began its theatrical release in Poteau, Oklahoma, on November 10 and will continue to announce screenings throughout the United States leading up to the film’s DVD and on-demand release in February 2018. The film has won numerous awards on the film festival circuit with screenings at Bentonville Film Festival, The Wild Bunch Film Festival, Alaska International Film Awards and Covellite International Film Festival to name a few. 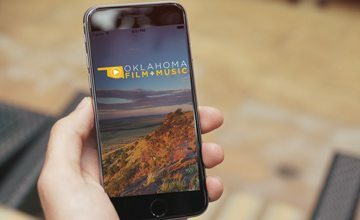 “Painted Woman” was filmed in Oklahoma last fall utilizing the Oklahoma Film Enhancement Rebate Program administered by the Oklahoma Film + Music Office (OF+MO). Filming locations included Guthrie, Norman, Oklahoma City and Ames. For more information on the theatrical release of “Painted Woman”, visit paintedwomanfilm.com.